MeldaProduction have made a potentially overwhelming effect relatively easy to wield, with some good results to be had. Easy multiband interface. Very good value for money. Useful solo, mute and bypass options. Clever transient and difference options. Should appeal to tweakers. Modulation section is overkill. Some settings result in a high CPU hit. 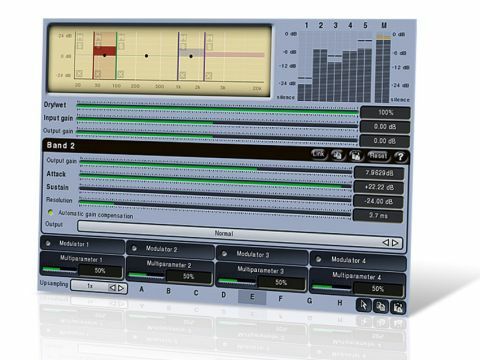 As with MeldaProduction's MMultiBandHarmonizer, MMultiBandTransient (MMT) makes use of an underlying multiband engine. As with other transient processors, it's designed for boosting or reducing the attack and sustain portions of sounds. Thus, each band includes attack, sustain and gain controls, and these are complemented by global input/output gain and wet/dry mix. But that's where the similarity with your typical transient processor ends, because MMT is blessed with an array of features worthy of the finest creative and mastering plug-ins. First up, each band has selectable window resolution (0 to 200ms), automatic gain compensation and three monitoring options (normal, difference and transient). You've then got four upsampling options (up to 4x), eight parameter memories (with morphing between the first four) and a flexible display with per-band signal metering. Further settings include high-quality upsampling (using steeper linear phase filters at the expense of added latency), window rescaling, modulator and automation resolution (five settings), channel processing modes (stereo, mono, surround and so on), three crossover options (analogue, linear phase and hybrid) and MIDI CC assignments. MMT's most complex aspect is its modulation section, including everything from simple LFOs to complex multiparameter combinations and inverse modulations with custom oscillator shapes. This raft of heavyweight modulation options worked well for MMultiBandHarmonizer, but we feel that it's somewhat over-engineered and superfluous for a transient processor. The multiband engine at the core of MMT is like that of a typical multiband compressor or limiter. You can use up to six bands, move crossover points, adjust the width of the bands, change per-band levels (+/- 24dB) and link all parameters for easy global adjustments. The big difference is you're shaping the transient behaviour of each band, rather than compression settings. While attack and sustain controls are on the lower part of the interface, most other settings are changed in the display graphic. Here you can solo, mute and bypass bands, as well as selecting them, which brings up their settings in the panel below. This is incredibly helpful, enabling you to solo in on specific areas, adjust band limits and bypass to compare the results. There are also band-specific options to monitor only the transients or the difference between dry and wet signals, which you can even leave permanently engaged for creative uses. The benefit of having a multiband transient effect is that you can concentrate its processing on specific frequencies within a signal. As ever, the obvious candidate for transient trickery is drums and we achieved everything from subtle enhancement to abrupt 'clipped' sounds. We tried individual elements and whole kit mixes, and in the case of the latter, you can, to some extent, single out kicks and snares for treatment - useful for simple enhancement and more extreme cases where you're trying to 'rescue' poorly recorded material. We were even able to reshape the picked sound on a bass guitar. We also delved into some of MMT's more complex settings, including crossover styles and upsampling. We found the linear phase crossover very CPU hungry, and combined with the maximum upsampling settings, we began to hit problems. Luckily, you don't really need to use any of these features to enjoy good results, although they could be handy for mastering. We also found using multiparameter modulators hit the CPU hard, but Melda say that they're working on improving this particular aspect. All told, MMultiBandTransient is a flexible and affordable plug-in with some nice touches, and if you steer clear of the more CPU-sapping aspects, it's also pretty useful. 1. Drum kit: First solo up band 2 for kick drum, adjust attack and sustain, tweak frequencies, try transient only setting, reduce resolution size, back to normal mode, adjust level. Now band 4 for snare. Adjust frequency first, then attack and sustain, then resolution, then auto gain compensation, and resolution again. Come out of solo and adjust levels of kick and snare bands. Bypass to compare. 2. Picked Electric Bass: A simpler set up with just 3 bands. Solo band 2, adjust frequency limits, adjust attack and sustain, adjust levels. Out of solo bypass to compare a couple of times. 3. Drums and bass together: Adjust balance between two, bypass to compare.